These are mostly sad pictures, but I’ve been doing them all year so seems like I should keep it up. It does seem a bit like driving a stake through the Bull’s heart. 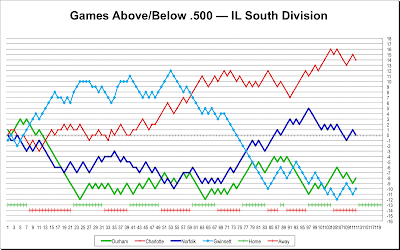 On the other hand, because of what was noted yesterday, we still should be seeing some good baseball this home stand. Don’t forget that we only have 19 home games left. After that no…Bulls…baseball…at … all. 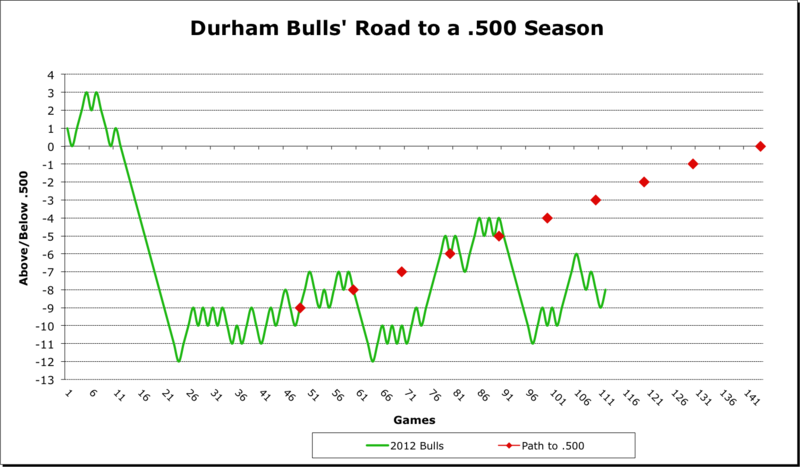 In the South Division, the Bulls are hanging on in third place and they face the fourth place team for the next four games. It will be an opportunity to move up some and push the Braves down some. Standings. Way back in late May we set up a chart to keep track of what seemed to be a reasonable goal for the Bulls, if they could get things on track. Does not look good. 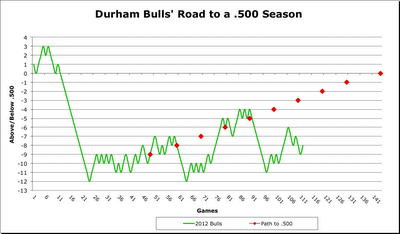 With 32 games left in the season, the Bulls will have to win 20 to break .500. That means playing .600+ ball. Not likely. 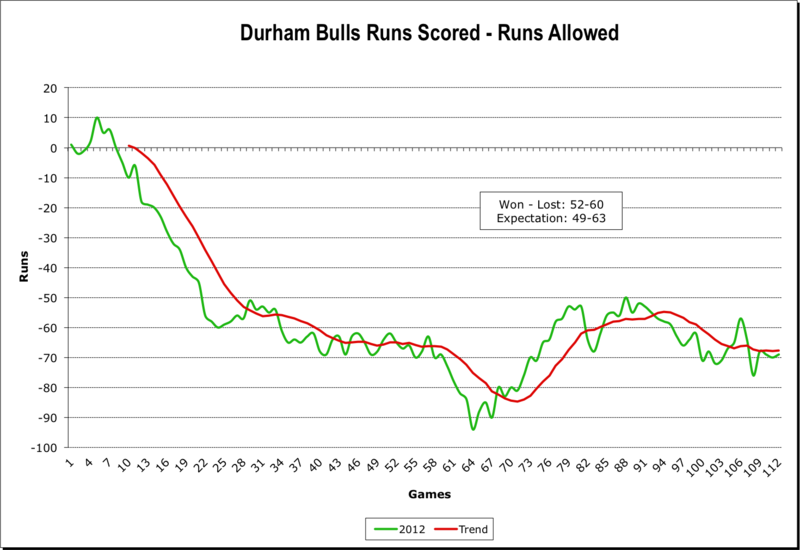 Looking at the Runs Scored/Runs Allowed metric, we Bulls fans can take cold comfort from the fact that under the Pythagorean Expectation model, the Bulls would be doing even worse (49-63) than they are (52-60). 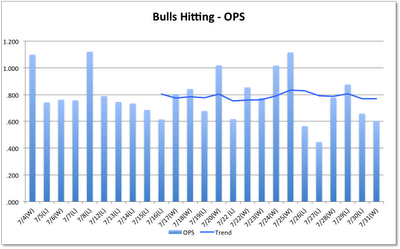 That may be attributed to the Bulls bullpen which, although not great, isn’t all that bad either. The really sad tale is Bulls pitching. 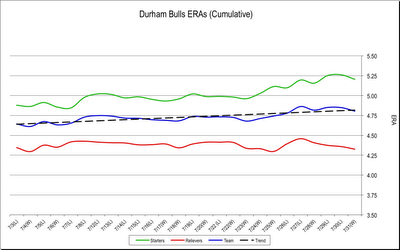 This chart shows the cumulative ERA for the Bulls over the last 25 games. 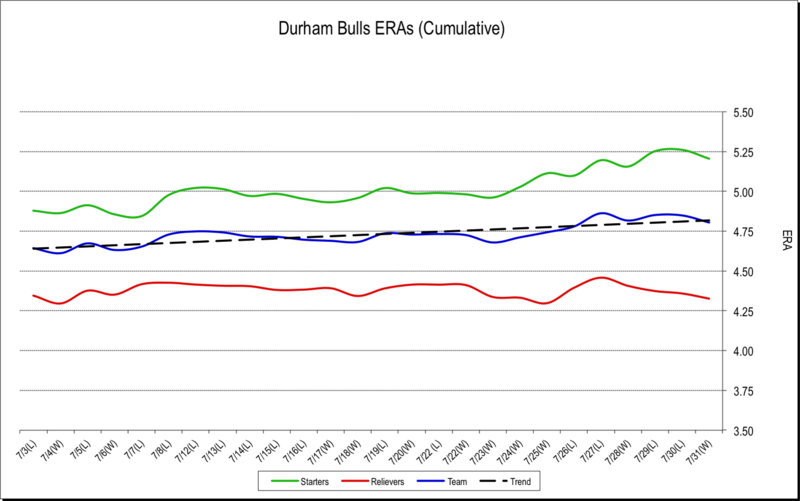 At 4.80, the Bulls are the worst in the International League, although when you pull out the starters and relievers, it’s obvious what has made a difference. 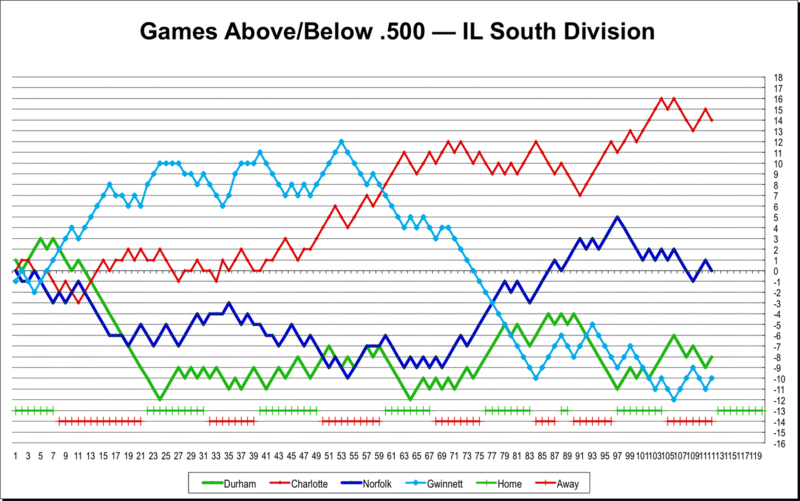 Lastly, the hitters over the same number of games, although the trend line is simply a 10-game moving average. Not bad (pretty good, actually).